Mini dental implants, also known as MDI’s, are a miniature titanium dental implant that acts as a tooth root replacement. Mini dental implants are significantly thinner than the traditional dental implants which were originally designed for retaining dentures. The mini dental implant device is a 1 piece titanium screw with a ball shaped head. 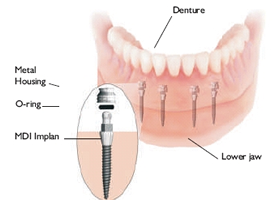 A traditional dental implant is made of the implant and the abutment which is connected on top of it. The mini dental implant features a ball shaped head which acts as a "snap" that snaps into a socket-like connector. This connector is a retaining fixture that is incorporated into the base of the denture. The connector is unique as it achieves a connection using a rubber o-ring inside the socket connector. This will provide adequate retaining force to hold the dentures in place while performing everyday activities such as eating and talking. However, when more force is applied, the connection can be forced open, enabling the removal of the dentures. As with the name mini dental implants, they are considerably smaller than traditional dental implants. Mini dental implants are 2 millimeters as opposed to 4 - 5.75 millimeters. Mini dental implants have become more common as procedures have gotten easier and success rates have continued to grow as the years have passed. With the success rates at a high and the ease of the procedure, dentists have found additional uses for mini dental implants. As always with any dental procedure, the cost is always an important aspect to consider for any patient. Those looking into having the mini dental implant procedure will find that they are cheaper than traditional dental implants. They can be as much as 60% cheaper than conventional dental implants. Not only is the procedure affordable, it is also quick. The procedure is as simple as drilling a small pilot hole into the jaw bone and then positioning and screwing in the mini dental implant until it is completely in with only the ball head visible. The entire procedure can be completed in less than two (2) hours, as it is minimally invasive. There is no cutting of the gums and no stitches will need to be removed at a later date.